Can We Exercise Too Much? In the United States and around the world today, we’ve become obsessed with exercise. So much so that you can literally sit on your couch and shake a weight in your hand and supposedly get into shape without even standing up. Well first of all, don’t be fooled by crazy infomercials that say you can jiggle your belly fat away or a shake weight will slim you down. Secondly, don’t over think it! Sometimes we get so crazy with exercise we do too much. You can also stop by OmegaBoom.com for more info about weight loss. Too much exercise may be a risk to your health. The following guest post by Lily Samuels discusses just that. Chances are, as college students, you want to get fit and stay fit. The pleasures of exercise, especially during times of stress, such as exam season or just after a hard day can be manifold and the benefits felt can be enormous, especially with the rush of endorphins you get after a great workout. However, a report featured in the NY Daily News suggests that too much exercise can actually end up being bad for us. Here’s the lowdown on why. On CPR training explains that intense exercise, done every day, for more than one to two hours can be very physically demanding and challenging, not just on the limbs, but on the heart and lungs too. In the abovementioned article, two United States cardiologists suggest that overdoing exercise for long periods of time can raise your risk of developing scar tissue and abnormal heart rhythms. They studied a group of fifty thousand people, fourteen thousand of whom were runners. Some ran moderate distances of five to twenty miles every week and some ran even longer distances – as you would in a marathon or triathlon competition. They discovered that though the runners were, on average, likely to live longer, the health benefits were more likely to be found in those runners that chose to run smaller distances as oppose to those who did intense training. Doctors recommend that instead of doing long distance, intense running, you instead limit this type of exercise to interval training done during a short period of about ten to twelve minutes. You’d sprint as fast as you can as far as you can until you’re out of breath, then stop until your heart rate goes back to normal, then do the same again, repeating until your time is up. It’s an obvious statement to make, but throughout the teen years, hormones can be really problematic, ending up causing a lot of stress and upset with emotions, not to mention the physical aspects such as troublesome skin. Many, as a way of trying to cope with this emotional rollercoaster might turn to exercise as a way of dealing with their feelings, but overdoing it, whether it be with long distance running, weight training or swimming can actually send the hormones into overdrive. 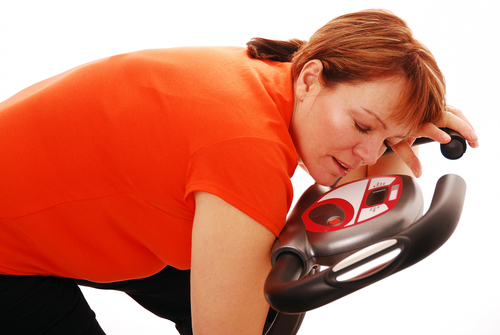 The effect of too much exercise on the hormones is twofold. Firstly, using exercise moderately as a way of dealing with stress is a good thing. It helps release feel good chemicals which give you an energy boost. When we’re stressed we release a hormone called Cortisol which in turn gets the adrenalin pumping, so a small amount of exercise will help combat this. However, too much exercise can actually cause the body to become traumatised and experience physical stress. When this happens, to compensate, the body releases chemicals called Corticosteroids which can impact upon the immune system and actually make you become ill. This is very often why people who compete in high impact evens like Iron Man competitions or Triathlons become unwell after the event. They’ve trained to such a high level and put their body through so much that their defences are really low afterwards and they’re more likely to pick up flu bugs or other infections. One of the key male hormones is testosterone and when this is overproduced it starts to morph into a chemical called DHT (Dihydrotestosterone). This substance, if not kept in check can lead to all sorts of issues within the body, but the main one being premature hair loss and male pattern baldness. This is distressing at any age, but especially so in someone who is young and apparently very healthy and fit. However, this phenomenon isn’t just restricted to men. Women also carry smaller amounts of testosterone in their systems too, but these can also be increased by undertaking too much exercise. The effects on women are that they may suffer the same type of hair loss on their heads, but begin to grow more hair on their face and body, which can be very upsetting. This type of occurrence is more common in men and women who train with weights in excessive amounts. The overall key here is to vary your workout routine, to keep it simple and above all, not to over do it at all, workout for short periods so you do become out of breath and raise your heart rate, but take care to ensure you get adequate rest periods too, rather than high impact over a few hours with no breaks at all. It is one thing to be fit and lean, but it’s not worth putting your health and wellbeing at risk. If you’re in any doubt about your exercise regimen, then speak to your doctor or healthcare practitioner for more help and advice. Questions? Comments? Leave a Comment Below!